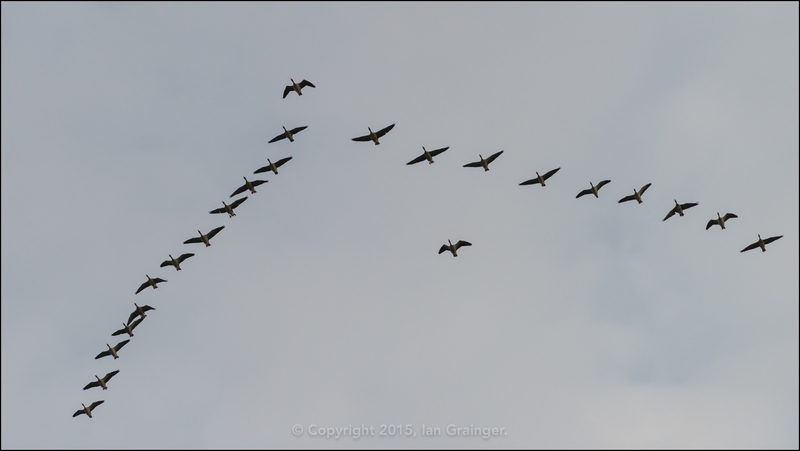 I was quite fortunate this week to witness the classic V shape formation of some migrating geese! The V shape formation, also known as a Skein, is used by the birds to increase their range while expending less energy. Each bird, other than the lead bird, flies in the up-wash of the wing tip vortices of the bird ahead. The up-wash helps the bird support its own weight in flight, similar to a way a glider maintains height in rising air. The birds occasionally switch positions in the formation so that each bird has the benefit of reduced drag, meaning that fatigue is spread evenly amongst the flock. Flying in this way can yield up to a 70% increase in range, which is quite remarkable! Apart from the sight of the birds flying overhead, there was also the very distinctive honk, honk sound as the flock passed by, which always brings a smile to my face.